The foramen lacerum is a triangular opening at the bottom of the skull located at the base of the medial pterygoid plate. 1. 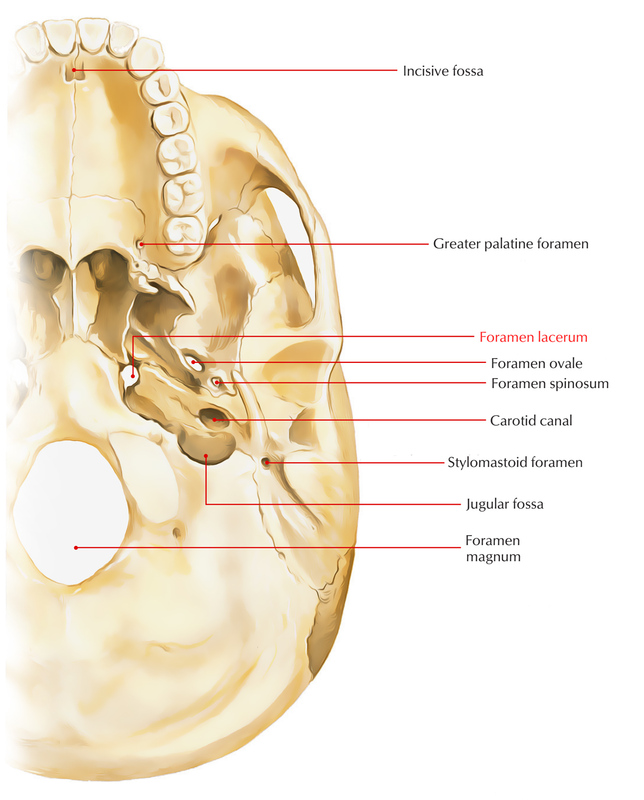 The foramen lacerum is a triangular opening located in the middle cranial fossa anterior to the petrous apex, which forms its posterior border. 2. The body of the sphenoid bone at the junction of greater wing and pterygoid process creates its anterior border. 3. The basilar part of the occipital bone creates its medial border. 4. It is nearly 9mm long and 7mm wide. Small meningeal divisions of the ascending pharyngeal artery. Emissary veins travels via the cavernous sinus towards the pterygoid venous plexus. 6. The internal carotid artery travels along its superior surface but does not cross it. 7. The greater petrosal nerve inserts from the posterolateral aspect and departs anteriorly as the nerve of the pterygoid canal. Meningeal branch – ascending pharyngeal artery. The artery of pterygoid canal, the nerve of pterygoid canal along with some venous drainage passes via the foramen lacerum. In order to create the nerve of the pterygoid canal, the greater petrosal nerve combines with the deep petrosal nerve in the foramen lacerum. The deep petrosal nerve carries sympathetic and the greater petrosal nerve conveys parasympathetic fibers of the autonomic nervous system to blood vessels, mucous membranes, salivary glands, along with lacrimal glands. Furthermore, one of the terminal divisions of the ascending pharyngeal artery travels via the foramen lacerum. Some emissary veins pass through the foramen lacerum and connect the extracranial pterygoid plexus along with the intracranial cavernous sinus and give an unrestricted route for infection. The internal carotid artery travels in the base of the skull from the carotid canal, rising and travels superior towards foramen lacerum at the same time as it exits the carotid canal. 1. Nasopharyngeal carcinoma is an exceptional form of head and neck cancer. It starts at the back of the nose in the upper part of your throat. This area is referred to as the nasopharynx. The nasopharynx is unstably placed over the roof of mouth at the base of skull. Nostrils open inside the nasopharynx. 2. Nasopharyngeal angiofibroma a.k.a. juvenile nasopharyngeal angiofibroma is nonthreatening histologically but locally aggressive vascular tumor that develops in the back of the nasal cavity. It adolescent males are mostly influenced by it. Patients with nasopharyngeal angiofibroma usually experience one-sided nasal blockade along with continuous bleeding. 4. Malignant melanoma a.k.a. malignant melanoma is a type of cancer that arises from the pigment-containing cells called melanocytes. Melanomas typically occur in the skin, but may seldom arise in the mouth, intestines, or eye. 5. They most frequently occur in women on the legs, whereas they are most frequent on the back in men.